We can all agree that Blockchain provides greater transparency, especially in the field of asset tracking. Since that particular topic has been popular in recent months, we decided to share our view on it, and the Blockchain-based projects we have. Firstly, our CTO’s view on how the combination of Python and Blockchain can solve the problem of asset tracing, and secondly, a keynote by Daniele Mazzei, TOI’s CTO. So, even though Maker Faire Rome 2018 is over, that doesn’t mean there’s no exciting stuff to share from it. Like the video, we are about to present here. 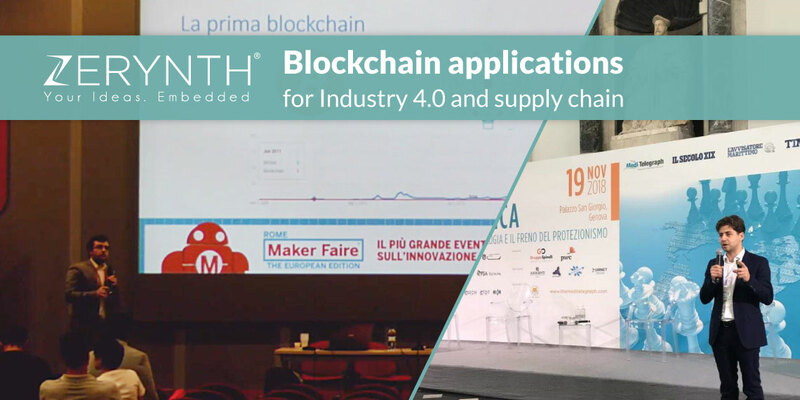 Giacomo Baldi, Zerynth’s CTO, presented a keynote with the title “Le applicazioni della Blockchain oltre le Cryptovalute” on October 13th. As you can see from the title, the keynote was in Italian. If you want to learn more about Blockchain applications and get a detailed introduction to the topic of Blockchain this is the video for you. Giacomo starts the keynote by explaining what Blockchain technology actually is, and moves on to explain what real-life problems Blockchain can solve. You can learn more about the topic, and the combination of Blockchain and Python, in Giacomo’s article “How to use Python on microcontrollers for Blockchain and IoT applications“. Somewhere after the first half of the video, Giacomo explains the value of smart contracts. More precisely he explains their value for the supply chain and tracking of goods. Now, the Blockchain-based tracking system that he mentions is covered in this article by Daniele Mazzei, TOI’s CTO. You can read it and find out how TOI’s 4ZeroPlatform and Zerynth’s Ethereum library helping monitor environmental conditions of shipments and adjust the price of transported goods in real-time. Since the topic of Blockchain is highly interesting and intriguing, there is always a need to explain it further. Here we see Daniele, during his keynote in Genova, explaining Blockchain and industry 4.0 solutions for logistic. You can watch the whole conference video below, but Daniele’s keynote starts around 3:50:00. Keep in mind that the whole keynote is in Italian. You can read more about Daniele’s keynote in this Medi Telegraph article. But that’s not all – you can watch an interview with Daniele Mazzei, straight from the conference, and hear what he thinks about Blockchain and its evolving nature. Of course, the topic was as popular at Electronica Fair, as it was at Maker Faire. Our team was hosted at the RS Components booth, our partners. It was a great opportunity to work together with the DesignSpark team and showcase the new and improved DesignSpark Zerynth Studio.